Rated: PG for mild action and some rude humor. Super spy teams aren't born...they're hatched. Discover the secrets of the greatest and most hilarious covert birds in the global espionage biz: Skipper, Kowalski, Rico and Private. These elitest of the elites are joining forces with a chic undercover organization, The North Wind. Led by handsome and husky Agent Classified (we could tell you his real name, but then...you know), voiced by Benedict Cumberbatch. Together, they must stop the villainous Dr. Octavius Brine, voiced by John Malkovich, from destroying the world as we know it. The breakout stars of DreamWorks Animation's hit "Madagascar" movies get their own big screen comedy-adventure, in which the stakes couldn't be higher for the Penguins. Their globetrotting adventures take them to Antarctica, Venice, the desert, Shanghai, New York City and ... Kentucky), during which they experience glory, engage in espionage, foil an evil scientist's/octopus' dastardly plot -- and devour cheesy snacks -- like no penguins have ever before. 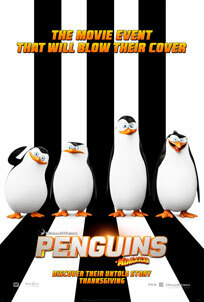 PENGUINS OF MADAGASCAR features the voices of Tom McGrath, Chris Miller, Christopher Knights, Benedict Cumberbatch, Ken Jeong, Annet Mahendru, Peter Stormare and John Malkovich. The follow-up to the 2011 hit comedy "Horrible Bosses" reunites Jason Bateman, Charlie Day and Jason Sudeikis as everyone's favorite working stiffs: Nick, Dale and Kurt.